The Oregon Supreme Court held oral arguments Friday morning in a case that could upend the City of Lake Oswego's rules that restrict access to Oswego Lake. 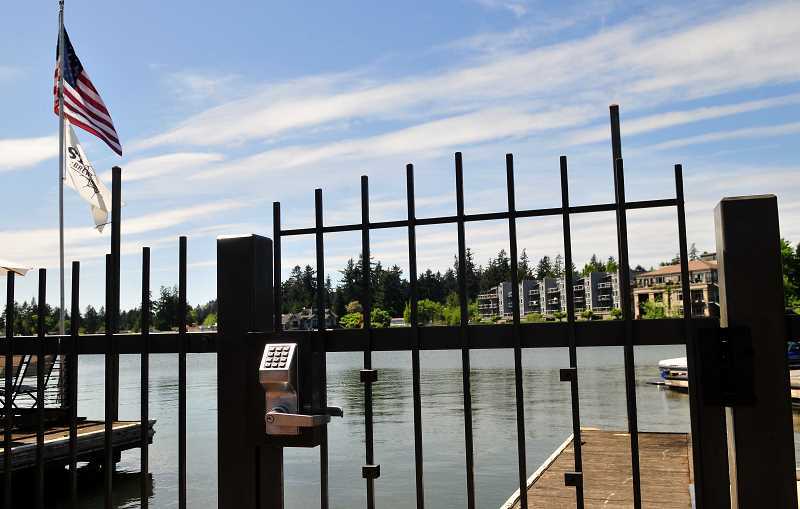 Portland attorney Mark Kramer and former Lake Oswego Planning Commissioner Todd Prager filed their lawsuit in response to a 2012 city ordinance that prohibited the public from entering the lake or launching boats from city-owned waterfront parks such as Millennium Plaza. The suit also questions a separate rule that restricts use of the Lake Oswego Swim Park to city residents. The plaintiffs argue that Oswego Lake is a public waterway under Oregon's Public Trust Doctrine and that the city's park restrictions — coupled with the fact that the rest of the lake perimeter is privately owned — create a de facto ban on public usage of a public waterway. "Context matters," plaintiffs' attorney Thane Tienson told the justices. "There is literally no other means of access by the public to the waters of Oswego Lake — and that was deliberate." In addition to overturning the city's rule, the case asks for a declaratory judgment to affirm the plaintiffs' broader argument about the status of the lake as a public body. That's a step that the Clackamas County Circuit Court and the Oregon Court of Appeals both refused to take in earlier rulings, opting instead to issue narrow decisions focused only on the city's park restrictions. Both lower courts sided with the defendants, prompting appeals by Prager and Kramer that brought the case to Oregon's highest court for oral arguments on Friday. When questioning Tienson, the justices appeared to focus heavily on the rights of Lake Oswego to regulate its own parks. They also questioned whether a distinction should be drawn between city-owned and state-owned public lands. "Our answer is there should be no distinction," Tienson replied. "We believe that all public parks that are abutting waterways should provide access." The justices then asked Tienson to cite cases where a state doctrine has overridden a city's home-rule authority, and Justice Martha Walters questioned whether state law would impose an obligation on the city to specifically ensure access, rather than to simply not prohibit it. The case has three defendants: the City of Lake Oswego, the State of Oregon and the Lake Oswego Corporation, a nonprofit group that controls the lake on behalf of lakeshore homeowners and those nearby with deeded access. The three groups split their presentation time, with a different lawyer speaking for each defendant. When the justices questioned Robert Koch, the city's attorney, they turned their attention to the swim park issue. Justice Rives Kistler questioned how Lake Oswego would justify excluding non-residents and whether it would be appropriate for any city to ban non-residents from city parks. For example, he asked, could Oregon state parks exclude Washington state residents? Koch replied that Lake Oswego views the swim park as a limited resource that can't be expanded and wants to make sure the park stays available to residents. It costs the city money to keep the park operational, he noted, which means Lake Oswego taxpayers are ultimately the ones footing the bill. "This is simply the city managing a city resource," he said. The court mostly skipped over the issue of the lake's public ownership status when questioning Tienson, but Justice Lynn Nakamoto raised the issue during Koch's defense and asked whether the city would feel obligated to re-examine the 2012 ordinance if the court ruled that the lake is public. Koch replied that the city takes no official position on the matter, and that the 2012 ordinance was exclusively focused on managing its park lands. That prompted Chief Justice Thomas Balmer to question why the city has posted signs referring to the lake as private if it takes no position on the issue. The state's lawyer, Carson Whitehead, appeared to concede the point that the lake is public, but drew a distinction between public use of a body of water and public access to that water. The Public Trust Doctrine does not apply to land along the shore of a lake, he argued, and no precedent exists that would require the state to enforce access to public waterways through adjacent land. Kistler asked how the state would respond if, hypothetically, one of the plaintiffs were to jump over a fence in a city park and land in the lake. "Once a person is in the lake, we think the public has a right to be there," Whitehead replied, although he clarified that the city might consider the hypothetical scenario a trespassing violation. During his presentation, Lake Corporation lawyer Brad Daniels asked the court to keep the case narrowly focused on whether Lake Oswego can restrict access through parks and to ignore the broader question of whether the lake is a public body of water. The city's ordinance, he argued, should be viewed as akin to a time, place and manner restriction in the interest of public safety. Tienson was allowed a brief rebuttal period at the end of the proceedings, during which he again called for the court to resolve the broader issue of lake ownership. The Lake Corporation views itself as the private owner of the lake, he argued, and that view has influenced the city's policies. "A resolution of the dispute over the lake's status would serve a useful purpose here," he said. Justice Rebecca Duncan questioned whether such a ruling would require the city to open or modify all of its parks for water access. Tienson replied that Millennium Plaza Park already features an area with convenient water access, so no further modifications would be necessary. The oral arguments were held at Aloha High School in order to give students a chance to observe Supreme Court proceedings. The Oswego Lake case was followed by a discussion in which students were able to ask the justices questions about the court, although not about the case at hand. The court offered no timeline for a final decision.